Package contains Digital Inclinometer, as above, and Companion Unit. Also comes with case and connecting cable. Two-inclinometer technique and procedure is well defined in the 5th Edition of AMA Guides. 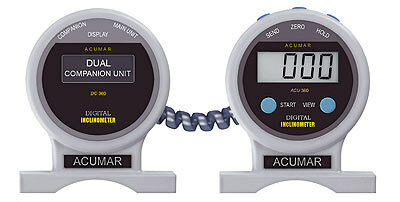 Acumar Dual Inclinometer contains modern features that simplify measurements and increase objectivity. 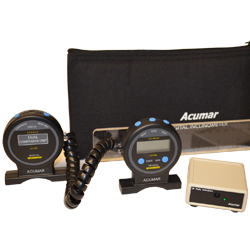 Acumar Dual Inclinometers can simultaneously capture both angles by the press of a single button. It allows up to six pairs of data for viewing and recording to greatly speed up data capture and analysis. Optional infrared wireless computer interface eases data transfer from inclinometer to a computer. Example Excel® based template is provided to demonstrate getting started with a computer-based documentation and presentation system. 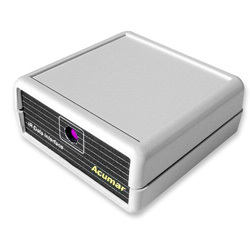 Requires USB (Universal Serial Bus) port; example templates require Microsoft Excel® 2000 or later. 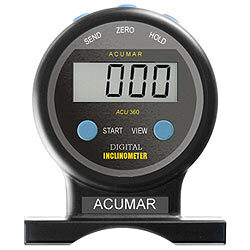 The Acumar Digital Inclinometer Suite provides accuracy, repeatability and objective documentation of range of motion measurements.